This story follows on from a previous post on the renovation of a Victorian Tiled Reception Area at a listed Georgian Townhouse in the middle of the small market town of South Moulton in North Devon. You may recall he was struggling to clean the floor in the reception area and I was called in to sort it out. Whilst I was there he also asked me to deep clean and seal the Kitchen Quarry Tiles. Kitchens as you can imagine are one of the busiest areas in any house and as a result the floors do see a fair amount of wear; in this case the Quarry tiles were dull and lifeless and I suspect any previous sealer had long since worn off. The Quarry tiles were in a better state than the Victorian tiles I discussed in the previous post so a less aggressive course of action was required. 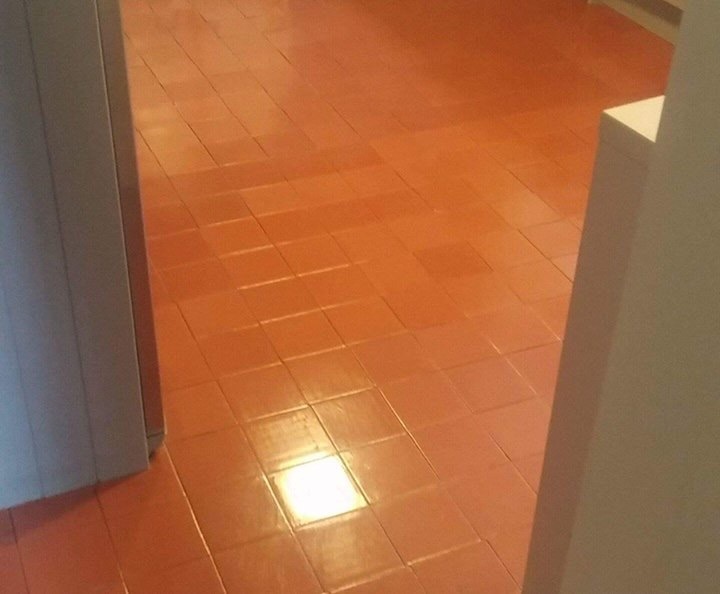 In this case I applied a strong dilution of Tile Doctor Pro-Clean and left it to soak in. Pro-Clean is an effective tile cleaner which will clean and strip off old sealers in a strong dilution. This was important as I wanted to be sure any remaining sealer would be removed, typically sealers wear off in the high use floor areas first so it was quite possible some sealer would still be present on the less used parts of the floor. After ten minutes I agitated the solution with a black scrubbing pad fitted to a rotary scrubbing machine to really get the floor clean and then rinsed off the soiled cleaning solution with water and a wet and dry vacuum before leaving it overnight to dry off fully. The following day I returned and after rechecking the moisture levels to ensure that they had adequately dried out I started to seal the Quarry tiles in the Kitchen using Six coats of Tile Doctor Seal and Go which leaves a satin finish once dried and gives the tiles a freshly mopped or slightly glazed look. 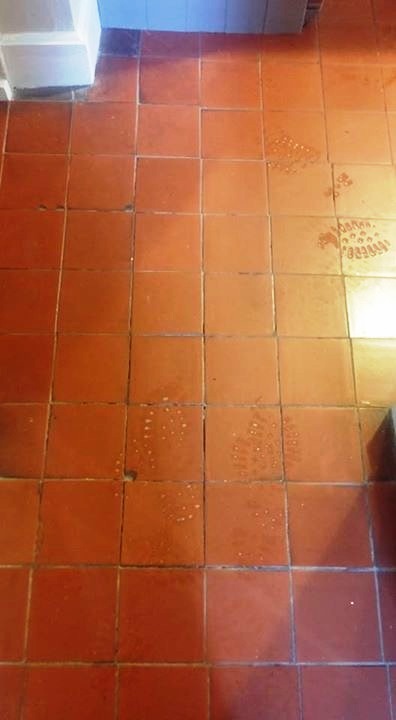 This entry was posted in Work History and tagged Georgian Townhouse, hallway, Listed Building, North Devon, quarry tile, quarry tile cleaning, Quarry Tile Sealing, south molton, Tile Buffing by AbzDominise. Bookmark the permalink.